New Zealand Group Tour Specials and Deals | Sale on Now! You won't be able to beat the value offered with our range of New Zealand Escorted Coach and Small Group Luxury Tours. Our dedicated team of travel consultants will guide you through the trip selection process, compare trips, read past passenger reviews and you will enjoy Exclusive Savings on every guaranteed departure. Essential information you need to know before travelling to New Zealand. Download for free - simply complete the details below to download. Discover the birthplace of New Zealand as we know it today on this tour of the North Island. Kotare Northland tour offers a unique view of Northland’s mix of natural beauty and fascinating heritage, making it an unforgettable holiday destination for locals and visitors alike. This South Island tour is jam-packed with magnificent landscapes and great sights. Enjoy the picturesque resort town of Queenstown, be amazed while cruising Milford Sound, experience old mining heritage, rare native birdlife and famous southern hospitality on this leisurely holiday trip. Starting in Auckland and finishing in Wellington this 8 day North Island tour examines those must see New Zealand highlights. Enjoy a cruise through the beautiful Bay of Islands, experience a traditional Maori culture performance with a hangi feast. See the famous Waitomo glow worm caves and visit a working New Zealand farm - and a lot more. Designed for the time conscious traveler, this tour showcases the North Island's iconic attractions and geothermal hotspots. Travel in a comfortable coach and immerse yourself in the wonders of the North Island including the capital city Wellington, cultural Rotorua, the beautiful Bay of Islands and cosmopolitan Auckland. Join us on an 8 day escorted Coach Tour through the centre of the North Island experiencing the Islands of Northland, the geothermal wonders of Rotorua before enjoying the vineyards and Art Deco architecture of Hawkes Bay and the cool cafes and shops of Wellington. Characterised by picture-perfect beaches, warm Maori culture and magnificent geothermal spectacles, the North Island offers a uniquely different holiday experience than that of the South. If you’ve only got a few days and want to see the North Island this is your tour. This fantastic 8 day journey really shows off the North Island - Stay in the boutique wine village of Martinborough, experience Tongariro National Park, dominated by volcanic activity. A private sail on Lake Rotoitti visiting secluded thermal springs. See Rotorua’s geysers and boiling mud in the morning then enjoy the Maori Hangi & Cultural Performance in the evening –and much more. Begin your journey across the South Island's best regions with a magical ride on the famous TranzAlpine railway. Soaring peaks, ribbon-like rivers of emerald green and deep, rocky gorges set a precedent for a truly unforgettable Kiwi touring holiday. Travel by luxury coach across the South Island's best region. Enjoy a relaxing 9 day escorted tour around the South Islands hot spots. Explore the Southern Alps on the TranzAlpine train, cruise down wonderful Milford Sound, experience a high country farm and see the West Coast Glaciers with plenty of time in between to experience many great optional tours and activities on the way. Ideal for the time conscious, this tour offers unbeatable value and provides an excellent coverage of the North Island. This tour is fully inclusive which means you are not constantly putting your hand in your pocket once on tour. It provides an excellent range of superior hotel accommodation and luxury coach. This 9 day trip showcases the breathtaking scenic wonders of the South Island. Travel in a comfortable coach and explore Franz Josef National Park, glide along the waters of Milford Sound, experience the TranzAlpine train journey, renowned as one of the great train journeys of the world. After Auckland's harbour, geothermal wonders and Maori culture in Rotorua, it's on to the South Island for the TranzAlpine train, Franz Josef Glacier and a chance to cruise on Milford Sound. Get close-up and feeling the power of the largest active geyser in the southern hemisphere, as our local expert explains the mythology. This premium escorted tour combines culture and scenic highlights to show you the best that the North Island has to offer. Throw in some exclusive experiences and you will discover why New Zealand’s North Island is a magical place. Explore Auckland’s Waiheke, the famous Hobbiton movie set. a In Rotorua, where Maori culture thrives in an active geothermal landscape we sail aboard a luxury catamaran on the pristine waters of Lake Rotoiti and much more. This is the equivalent of ‘Business Class’ on wheels so just sit back and relax, everything has been taken care of. Your spacious Luxury Coach is decked out with all modern conveniences including a rest room - a fantastic way to experience the very best of New Zealand’s North Island. Be treated as a VIP and enjoy premium accommodation combined with a number of exclusive extras. Discover the spectacular central South Island, taking in the southern loop from Christchurch down the Southern Alps, through Queenstown and Fiordland National Park and onto the West Coast. The TranzAlpine train journey is a great way to finish off spectacular touring holiday! This itinerary is for guests seeking a premiere escorted holiday. We stay at first class properties, with an emphasis on hearty breakfasts and high end dining. This is accompanied by superior commentary from Tour Directors with rich cultural and historical knowledge. Our experienced drivers focus on getting you where you’re going safely. Characterised by soaring peaks, pastel-coloured lakes and unspoiled forests, the landscapes of New Zealand’s South Island are nothing short of spectacular. Enjoy stunning scenery and experience some of the south island's most amazing places in the company of like-minded people. This is ‘Business Class’ on wheels, just sit back and relax, everything has been taken care of. Your spacious Luxury Coach is decked out with all modern conveniences including a rest room, a fantastic way to experience the very best New Zealand has to offer. The beauty of travelling aboard this ultimate coach in a small group is that every aspect of your holiday is personal. Be treated as a VIP and enjoy premium accommodation combined with a number of exclusive extras. Beginning and ending in Christchurch, The highlight of your 10 day South Island tour will undoubtedly be the Doubtful Sound overnight cruise. Experience a TranzAlpine Train excursion through the Southern Alps. In Dunedin enjoy high tea at Lanarch Castle, a train excursion on Taieri Gorge Railway, and a unique star gazing experience at Mount Cook. Discover nature’s bounty, as you wander through ancient rainforests, cruise on spectacular Lake Manapouri and marvel at geothermal phenomena. Great film epics such as Lord of the Rings and The Hobbit were filmed in the vast wildernesses and enchanting landscapes of New Zealand. This inspiring journey showcases New Zealand’s natural splendors, culinary flair and fascinating indigenous cultures. If you’re travelling solo, you don’t need to be travelling alone. When you join this small-group luxury holiday you’ll be sharing the ‘New Zealand’ experience with other fun-loving travellers. Feel safe and leave the finer details to us, onboard our small group Luxury Coach. Our expert tour leader takes care of day-to-day planning so all you need do is sign up, turn up and enjoy the splendid views and fun excursions on this 11 day tour. Experience the best New Zealand’s South Island has to offer on thisclassic, all-inclusive 11 Day journey, travelling from Christchurch to Wellington. The highlights include a cruise in Abel Tasman National Park and a Doubtful Sound Wilderness Cruise, the alpine scenery of the Mt Cook National and the spectacular West Coast and Glaciers. Celebrate an unforgettable Christmas on this 11 Day Festive South Island Tour. Travel through the spectacular South Island and enjoy the festive season in a Kiwi atmosphere. Enjoy a Milford Sound Overnight Cruise, a Larchnach Castle visit and many other highlights! With a small group of voyagers, explore New Zealand’s North Island. Visit Auckland and Wellington, travel into the rustic, unspoilt coastal regions of the Coromandel and the Bay of Islands, famous for their dazzling white beaches and historic villages. Witness the South Island in Ultimate style and celebrate Christmas with a difference. Travel with a small group of only 20 people and celebrate with a traditional Christmas dinner at Walter Peak Station - a classic Kiwi high country sheep station that you can only get to by steam boat. Included is a great range of 'Must Do' excursions. There is no better way to see New Zealand's beautiful South Island. No stone is left unturned as you venture into the South Island less travelled. From the wild and pristine natural wonderland of Stewart Island to the spectacular vistas of Mt. Cook, through to Milford Sound, where you will sail under a blanket of mist and shadows on the crystal clear waters of the magnificent fiord. This comprehensive luxury New Zealand tour gets you off the beaten track and gives insights to magnificent natural landscapes. The Kiwi tour delivers a one-of-a-kind, quintessentially New Zealand holiday experience visiting some of the more lesser-known destinations. We offer great flight prices when booked as part of your New Zealand vacation package. 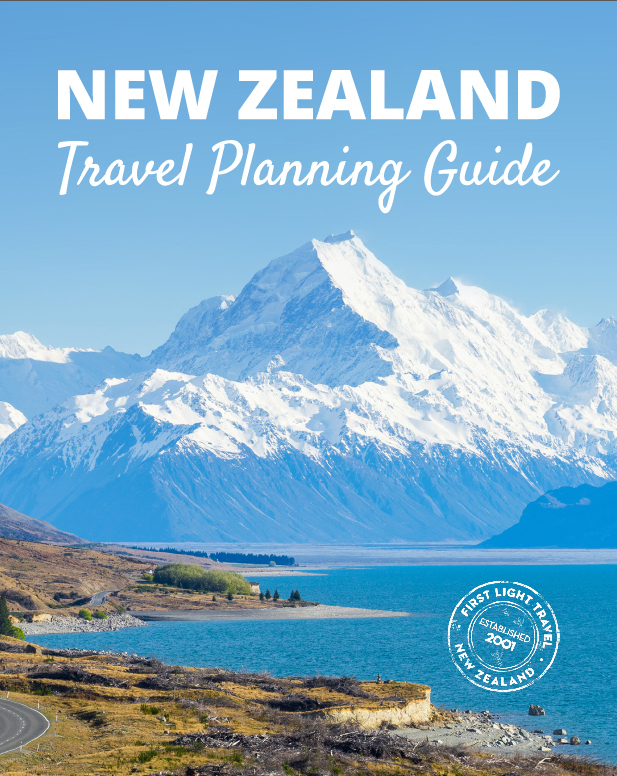 As the New Zealand travel experts we can give you the best advice and save you money. We support New Zealand's environmental care code - a 10 point checklist of things you can do when you visit NZ to help keep the environment clean and intact.